Mark Shelton is a firestick. A mainstream mystery, for sure...but an absolute underground metal thrashing "what's my name" Heisenberg to Manilla Road's legion of fans. 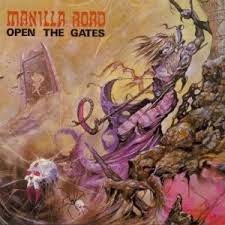 With a body of work that began stripping paint in the late 70's...to their just released 16th studio album..."The Blessed Curse"...Manilla Road has continued to bleed and coddle ears with tales of deliciously dark folklore and nefarious shadows. 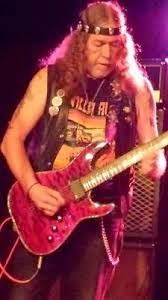 Mark Shelton, and his always thunder-ramping band, has been nothing, if not satisfyingly consistent...giving longtime followers and new fans alike exactly what they need. Whether they know it or not. Casey Chambers: I saw you at the airport coming back from Greece and was reminded what a hardworking band you guys really are. Mark Shelton: Oh yeah, Manilla Road is definitely a hardworking band. Have been for...coming on close to 40 years. 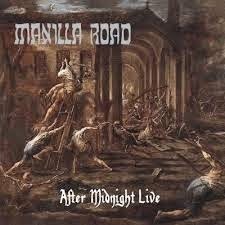 In 2017, it will be 40 years since the inception of Manilla Road. It's been a long road. Not to make a pun. Mark Shelton: Yeah, we played on a show called..."After Midnight". It was basically an alternative, mostly rock program that happened from midnight 'til 6:00 in the morning. It was totally freelance. It was whatever the DJs wanted to do. Most of the DJs were either volunteers or employees of the station or they were going through media education there, like I later did, myself. The show came about when Sherry Avett, who was one of the producers and co-producers of "After Midnight" and other specialty programs...and Tim Rice, another DJ, asked us if we'd be interested in doing a live concert in their studio and airing it at the exact same time that we were playing it. They knew we had just finished up our "Invasion" album...plus earlier that year, on Easter Sunday, there was this big riot out at Herman Hill Park where some bands were playing. We weren't playing that day, but I wrote a song about it that was getting some airplay. Anyway, Sherry and Tim both thought broadcasting Manilla Road live would be something really cutting edge for Wichita and we thought...'hell yeah, we'll welcome being on the cutting edge of anything.' Especially since we were virtually unknown at the time. It seemed like a good opportunity. I remember it was a blisteringly cold wintry evening and we were carrying our equipment through ice and snow to the studio. And we set up in there. Mike Metz, who now owns Thesis Audio, helped engineer the thing along with Tim Rice and some other people from KMUW. And I think Eric Enns, who was the engineer at Mort Recording Studio up in Newton where we recorded a lot of our albums, was there too helping do the mixing and everything. So, that's how that happened. We did the show. It came off pretty good. Sherry was the DJ/MC that night. Actually, I think Tim was the DJ and Sherry was sort of MCing. She was in the studio room with us and Tim was running all the equipment. We had a blast. It was a lot of fun. And it gave us some good radio exposure. Casey Chambers: So Manilla Road was getting some early radio play from the song you wrote about the Herman Hill Park riot. Mark Shelton: Yeah, that was the first song we ever had on the radio..."Herman Hill." Casey Chambers: And it turned out not only to be a timely song, but evidently a rather touchy one, as well. What do you remember about it? Mark Shelton: The band that I went to see that Sunday was called Roanark. And I can't even remember the names of the guys who were in it at this point, but we were friends with them and we went out to see the band. And then all that riot stuff happened. There was this Herman Hill activation group of some sort. It was basically for those who felt the people in the park had been wronged. So I went to check all that out. One of my radio friends, Jerry Sherwood, who was working for KEYN at that time was really active about reporting on all that. He was there. He had recorded lots of stuff as the riot was happening. He actually saw one of the guys get shot. He was pretty important on a fact based level about what was going on right in front of him. And Jerry lost his job over it. He got fired over the things he was saying. The whole thing got shut down and washed under the carpet, you might say. At that point, we did what we felt we could. Tried to raise awareness about what was going on. We went into the studio. It was the first time we had ever been to a studio professionally and recorded a three song demo which we just called..."Underground." And yeah, we got lucky. T-95 (KICT) actually decided to go ahead and start airing the song. And it was on a reel-to-reel tape. They were playing it for awhile and it got a lot of response. And then all of a sudden, it just got cut off. Next thing I knew, they were handing us our tape back and they wouldn't give us an explanation as to why they couldn't play it anymore. After awhile, you just had to leave things alone, I guess. And by the way...those tapes had been lost for ages and we finally found one of the master tapes and it's in pristine shape. It was just hiding in one of those back corners you never look in. And I finally looked in it. We've already got it transferred to digital media, so it's probably gonna come out eventually. Casey Chambers: That's good to hear. That'll definitely blow out some built-up earwax. I'd like to ask you about another song. There is some fantastic guitar blistering all over..."Flaming Metal Systems." It was added as a bonus track on your "Crystal Logic" re-issue...but that's not where a lot of your fans first heard it. Mark Shelton: Yeah, "Flaming Metal Systems." I was riding my bike with John Miller and a bunch of my cronies. Recording industry guys. Very fun. We were riding up past the northern outskirts of Newton (KS) and there's a turnoff to Peabody, I think, that heads off toward Florence and then up around Marion Lake. And it was on that road where I saw a sign that said, Flaming Metal Systems. It was an advertisement for a fabrication company. When we stopped to smoke cigarettes and take a break, I said...'Hey, did you see that sign back there? That'd make a cool title for a song.' And I think it was "Little" Jim Henderson who told me, 'Well, why don't you write one then?' (laughs) I just thought it really sounded right, so I did. Well, Mike Varney (producer) had come across some of our work and decided I was a pretty good guitar player. 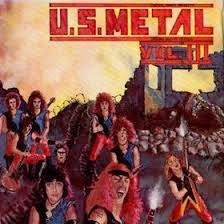 He had this compilation series called "US Metal: Unsung Guitar Heroes." He was getting ready to do his third volume of the series and asked me if I'd be interested in submitting a song. I said, 'Hell yeah!' We were in the middle of recording our "Crystal Logic" (1983) album at the time. It was perfect timing. I just quickly wrote a song that was geared for that album. I put in catch phrases like 'shrapnel', because his label was Shrapnel Records and made everything intertwine and fit metaphorically. And since it was a guitar heroes type thing, I did a solo at the beginning of it. And "Flaming Metal Systems" not only showed up on the album, but also became the most popular track on that release. The success of that song spawned the situation where I went out to California to meet with Mike Varney and for three days we were guests of Quiet Riot and Vandenberg. We went around to all the Keystone clubs with them and watched their shows, while at the same time Varney and I were trying to negotiate a deal. He goes, 'Yeah, I can't stand the rest of the album. It's just terrible. What I'll do for you is...I'll sign you right here and now if you promise to give me another album with ten songs that are just like "Flaming Metal Systems". And we talked and talked and talked and finally I told him, 'Sorry we can't do that.' At the time, I was all full of myself . Sorta narcissistic. I still am. But yeah, I just couldn't do that. And in a lot of respects, I probably should have...because "Flaming Metal Systems" was what broke us into the international market. 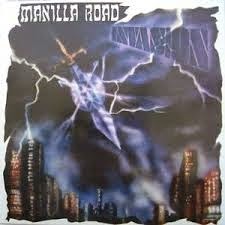 All of a sudden Manilla Road were known all over the world...instead of just being known in Wichita, Kansas. And so I may have made the wrong decision, but I have this moralistic musician crap going on inside me and I didn't want to do what felt like 'selling out'. I've always been about progression. Evolution. Things like that, y'know? I don't think music should stagnate. I was taking my cues more from Zeppelin and Purple than I was from AC/DC. Not everything had to sound the same. They were always progressing on to something else. Trying new styles and fusing stuff together. Casey Chambers: Turned out to be Varney's loss. 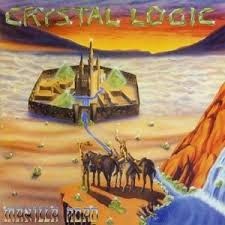 "Crystal Logic" went on to become a leviathan in Manilla Road's canon of heavy metal spankage. Mark Shelton: It was the first album that really went well for us. Our first album..."Invasion" did okay. We only pressed a thousand copies but we sold them real quick. We pressed another thousand and they were going out averagely. You gotta remember, we were just distributing this stuff ourselves. We were sending out demos all over the place but nobody was interested. So we just decided to become a record label of our own. And we were fairly successful at it. But then with "Crystal Logic", we had a big jump. I'd finally made connections with distributors on both sides of the U.S. Green Wall and Important Records. And Important Records in New York had a Swedish distributor that heard about us and started buying up "Crystal Logic" albums. One of them made it to a radio station in Holland and they started playing the stuff . And our song..."Necropolis"...just went (whooosh) through the roof for them. Next thing I know, we're getting a plaque in the mail from this radio station congratulating us on the best released album of 1983. The Swedish distributor started buying tons of product from us so we kept pressing "Crystal Logic." I think we had to start pressing more of our second album..."Metal"...too. And things started going really well. Casey Chambers: You guys must have been itching to get back into the studio by this time. Mark Shelton: Bassist Scott Park and myself really wanted Manilla Road to get heavier and faster. We were trying to fuse more metal into the psychedelic doom type prog-rock that we were doing...or whatever you wanna call it. Just looking for new territory, y'know? So our drummer at that point, Rick Fisher, decided he was going to bow out. He still worked with us for several years with the label and with our live shows, so it wasn't a bad disbandment or anything. But we had to find another drummer. We found Randy Foxe He was a bombastic and powerful drummer. He could do really great double kick stuff. So we brought him into the mix and recorded our "Open the Gates" (1985) album. 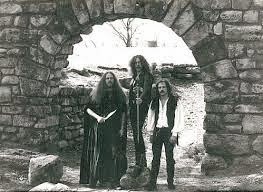 And while we were in the middle of recording..."Open The Gates"...we got offered a deal from a couple of labels in Europe and we chose the most lucrative which was Black Dragon Records in Paris, France. We're just a bunch of Kansas cowboys trying to live a dream, so it worked out really well. That Sweden distribution had spread "Crystal Logic" all over Europe and had made us, I wouldn't say famous, but known. Casey Chambers: No doubt! In 2005, it made Rock Hard Magazine's list of the 500 Best Rock & Metal Albums. Not too shab. Mark Shelton: Oh really? Do you know where it placed? Casey Chambers: It was in the 300s. Mark Shelton: Okay. I can't imagine Rock Hard putting us in the top 100. (laughs) They've never really liked us that much. That's a German magazine. They used to just ridicule us to death. The U.K.'s Kerrang! magazine used to tear us up, too. They named us the "ugliest" band in rock. Called our music "satanic dirge". At least they had nice journalistic terms to use. It was weird because once we got really super popular over in Europe, just in the last few years, the magazines did an about face and now they're all behind us. We've managed because I stuck it out. And I haven't ever given up. And because we still put out new music. We're not living off of our old deeds. And yeah, I suppose for the rest of my life I could run around playing songs off of "Crystal Logic" if I wanted to. And of course we have to play some songs off of that album every time we play live anyway or else y'know...people are gonna be really pissed. The main goal at this point is to make our fans happy anyway. There's still that ideal that we're trying to find new territory musically. Fusing this and that together with metal music. Seeing what we can come up with hoping that we are...y'know...cutting edge still. Doing something that nobody else is doing.